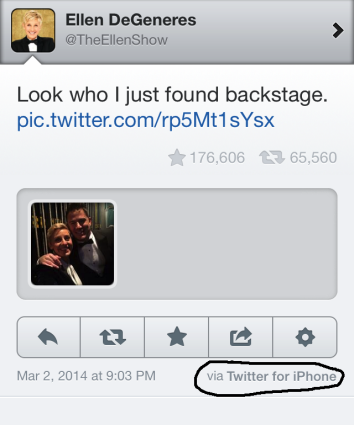 Ellen Degeneres Samsung selfie breaks tweet record, but she uses iPhone backstage. To recap, Samsung shelled out big money to sponsor the Oscars and still managed to come out of the event looking like the brand that people only use when they’re forced to. 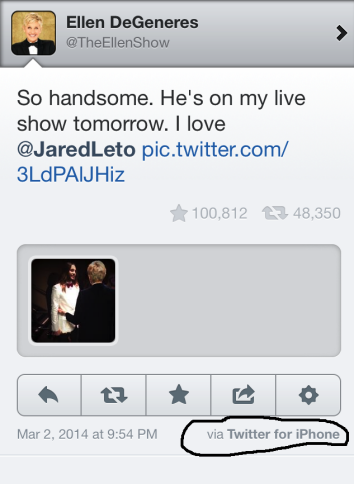 The only question now is whether DeGeneres will stay mum about the switcheroo, like Oprah did after she tweeted her love for the Microsoft Surface from an iPad, or blame it on a Drake-obsessed hacker, like BlackBerry “creative director” Alicia Keys did when people noticed she seemed to prefer tweeting from her iPhone. 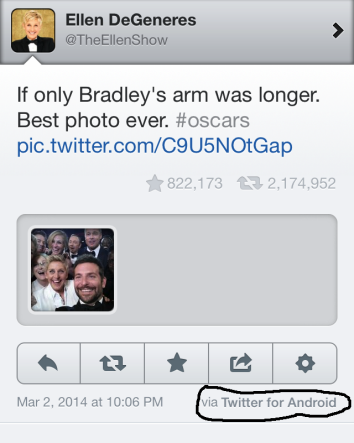 Sorry, I mean former BlackBerry creative director Alicia Keys.